Recorded using my Flip video camera, edited with Premiere. 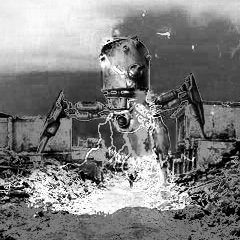 Sound track added, mix of sound from the video and a live recording of Apocalypso: Shayna Dulberger – upright bass, electronics; Chris Welcome – guitar; Walter Wright – electronics. This is the cover of our new Apocalypso CD, self-titled. The artwork, Indians hunting a Glyptotherium is by Shayna. 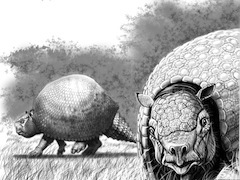 Glyptotherium is an extinct genus of glyptodontid, a group of extinct mammals related to the armadillo. Glyptotherium may have been wiped out by climate change or human interference. 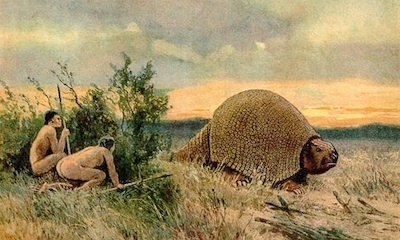 Like its living relative, the armadillo, Glyptotherium had a shell which covered its entire body, similar to a turtle. However, unlike a turtle’s shell, the Glyptotherium shell was made up of hundreds of small six-sided scales. Some species grew up to six feet long and its armor weighed up to a ton. Remains of Glyptotherium species have been found in tropical and subtropical regions of Central America, Mexico, Florida, South Carolina, and Texas to Arizona. The tour starts in Lowell at 119 Gallery. Sean and Jake arrive at 6pm, unload, head out to find food. Shortly thereafter Chris and Shayna arrive and unload. I’m watering the vertical garden, part of the gallery’s mural. Joe arrives and together we reconfigure the gallery. Show starts at 8pm. Apocalypso plays first followed by Ali Henry Duo, then we all play together. We head out to the Worthen House, established in 1898, notable patrons are include Edgar Allan Poe, Jack Kerouac, and Jimmy Breslin. It’s a late night! Saturday July 14, at l’envers in Montreal QC. We regroup next morning, down one. Joe isn’t able to come on tour, last minute responsibilities. Sean and Jake head south to Brooklyn, NY, and we head north to Montreal, QC. It’s hot. We’re hoping for cooler weather in Canada. A 40min wait at the border; we wait 20min in line then, as “musiciens” we wait 20min in Immigration while they check our venues for booze and ticket sales. We arrive in Montreal around 6pm, unload, then head out for dinner. It’s just as hot in Montreal! We arrive back at l’envers at 8pm. The tiny air conditioner is doing its best but it’s getting hotter and more humid. We set up behind TFGQ. People trickle in … Evan Lipson, who has moved to Montreal, arrives with Chloe and Yannick from AIDs Wolf. Joe, Shayna, Ellwood and I are in their video AIDS Wolf wins the Polaris Prize, they didn’t but they probably should have. Gradually the room fills. Matt and Emily-Jayne from Leamers arrive. We load out and follow Matt and Emily-Jayne to their place in East Montreal. They’ve just moved in, the house is strewn with boxes, odd instruments, and a cage for their bunny named Walter. Chris and Shayna have a cat named Walter, now a bunny! We check out the backyard, return to sit around the kitchen table talking for an hour or so, then clear a spot and crash. Sunday July 15, at Umi Cafe in Ottawa ON. Umi Cafe is located in Ottawa’s Chinatown but their website is in German! 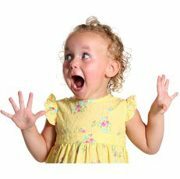 We’re up mid-morning, find our way back to the kitchen where Emily-Jayne is making breakfast that includes eggs, fried cheese, potatoes with assorted veggies and seasonings, and bacon. Delicious! We could stay forever but … on to Ottawa. We pack up and hit the trail, highway 417 to be more accurate, arriving around 6pm. The cafe owner has double booked. Our sponsors, Improvising Musicians of Ottawa/Outaouais arrive in the persons of Craig Pedersen and Renee Yoxon. The owner wonders if we would like to play upstairs. What’s upstairs? A private invite-only karaoke bar! Of course, a great room with a bar, a stage and space for the audience. I call my nephew Paul to tell we’re here and redirect him to the second floor. The Q&A session wasn’t recorded. It was fun answering questions, meeting and talking with audience members. We head out for a food & beer with my nephew Paul and Craig. Back to Paul’s house on Rosemont St where we spend the night. Monday July 16, at l’envers in Montreal QC. Tuesday July 17, at Marsonic 204 in Montreal QC. Tuesday July 18, at Cafe Maglianero in Burlington VT.
Wednesday July 19, at 119 Gallery in Lowell MA. Apocalypso is now Joe Burgio – movement; Shayna Dulberger – double bass, electronics; Chris Welcome – guitar; Walter Wright – electronics. Tracks recorded at 119 Gallery last Sunday. Apocalypso Trio @ ABC No-Rio, October 4, 2009. Last stop on our Fall mini-tour. Shayna is already back in Brooklyn. Joe and I drive down from Boston to New York City. We are playing in Blaise Siwula’s series COMA (Citizens Ontological Music Agenda) at ABC No-Rio on the Lower East Side. We decide to play short, fast and loud. The second piece is less aggressive. Shayna starts solo while I replace the battery in my amp. The third piece is Shayna and me. Chris Welcome – guitar, Jonathan Moritz – sax, Shayna Dulberger – double bass, John McLellan – drums. Jeff Platz – guitar, Kit Demos – double bass, John McLellan – drums. Joe Burgio – movement, Shayna Dulberger – double bass, Walter Wright – analog synths + Katt Hernandez – violin. After the gig we follow Kit Demos to his house. Joe sees potential UFO landing sites. We park in front of a purple barn. We unload. The barn contains a large a two-story performance space, unheated, and a backroom and studio, both heated. We stay in the heated backroom. Sunday September 27, we return to 119 Gallery for Lowell Open Studios. Shayna, Katt and I play that afternoon. We go for dinner at Udupi Bhavan, an Indian vegetarian restaurant. Group 1: Rémy Belanger-de Beauport – violoncelle, J-O Bégin – trombone, Walter Wright – analog synths. Group 2: Gordon Allen – trumpet, Katt Hernandez – violin, Shayna Dulberger – double bass, Isaiah Ceccarelli – drums. bodydrama: Joe Burgio, Betty Wang – movement, Matt Samolis – flute, Walter Wright – analog synths & video + Shayna Dulberger – double bass. Set 1: Tom Shad – bass, Evan Gallagher – Casio keyboard. Set 2: Apocalypso Trio: Joe Burgio – movement, Shayna Dulberger – double bass, Walter Wright – analog synth & video. I think, it was the best set of the tour. It was the shortest set of the tour. Good energy! Thanks to everyone who came out to see us play. Check out our MySpace page. You are currently browsing the archives for the Apocalypso Trio category.